It’s a com­puter game, but it will take you only minutes to com­plete. It con­tains no hero and no vil­lain. There are no points to win. The paid ver­sion of the soft­ware dif­fers from the tri­al in one respect: the main char­ac­ter may die. 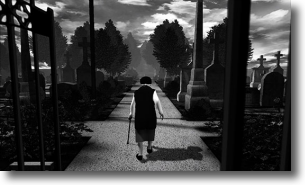 The Graveyard is a very short com­puter game designed by Auriea Harvey and Michaël Samyn. You play an old lady who vis­its a grave­yard. You walk around, sit on a bench and listen to a song. I down­loaded it imme­di­ately. We played the game once. I’m reminded, quite sud­denly, of what a com­puter can do for art. More power to them.